It looks like it’s going to be a beautiful week in Dallas, and when the weather gets nice, there is only one place we want to be: on the patio. If you’re craving a little Vitamin D – and a tall glass of something cold – then State & Allen Kitchen + Bar has you covered! 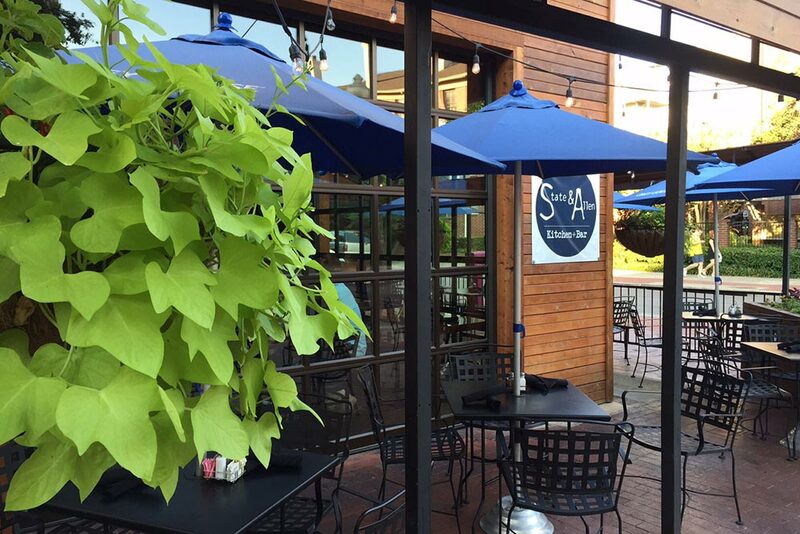 We hate to brag, but really – who has a better patio than State & Allen?! Located at the corner of State St. and Allen St., our wraparound patio is perfect for people watching, catching up with friends, and even hanging out with your dog! (Yes, our patio was the first in Dallas to be dog friendly.) Join us for lunch, dinner, brunch, or drinks anytime! · Monday-Friday Happy Hour – 3-7pm: Enjoy $3.50 domestics, $4.50 house wines, and $3.50 Triple Threat: New Amsterdam Vodka, Jim Bean Whiskey, and Camerena Tequila. · Tuesday Half Priced Drafts – All Day Long: Our vast selection of draft beer in half price on Tuesdays! Get your favorite local Dallas craft beer, domestics, or imports at a fraction of the price. · Wednesday Half Priced Wine – All Day Long: We call this Winey Wednesday because it’s the perfect night to grab your girlfriends and catch up on all the latest happenings over a glass or two. At half price, who can blame you for making this a weekly event? · Thursday $3.50 Moscow Mules – 7pm-Close: There is just something about a mule that everyone loves! Join us on Thursday nights for Moscow mule drink specials and dinner. · Friday Happy Hour All Day: Remember those happy hour specials we mentioned above?! Grab them all day on Fridays! · Weekend Brunch Cocktails 10am-3pm: $6 Bloodys, $3 Mimosas, $3.50 Greyhounds, Tequila Sunrises, and Screwdrivers. This is just a sampling of all the great Dallas drink specials available at State & Allen! Join us this week for Dallas patio weather and ask your server what the specials are for the full rundown. *Specials and menu items subject to change. Please ask your server for current offerings. Have you heard of PintHub? PintHub is an awesome new membership service that allows you to experience the best craft beers Dallas has to offer at low prices – or even FREE! Did we get your attention? Read on to learn about how you can get FREE drinks at State & Allen Kitchen + Bar with PintHub. PintHub is craft beer community for beer enthusiasts. Through the PintHub app, members of the service are able to see participating bars and restaurants, learn more about the different types of craft beer, and explore the beer scene around then in new ways. For just $9.99/month, craft beer lovers are able to explore new craft beers and restaurants they may never have known about before. What about the FREE beer? Yes, one of the perks of PintHub is that each day, your first beer is free at participating restaurants and bars! So if you come into State & Allen Kitchen + Bar and show us you’re a PintHub member, you can get a free glass of craft beer every single day, no questions asked! Pretty sweet, right? Getting started with PintHub is easier that you think! The PintHub community is housed in an app that is easily downloadable through the Apple Store or Google Play Store. Simply download the app, pick a membership option, and you’re on your way to free beer and Dallas drink specials. The app is loaded with resources to explore options for great craft beer in Dallas. Get started, and remember, you’re first beer is on the house at any of the participating restaurants – every single day! Every community is better with more people! Invite your friends to join in on the fun and make the community more robust. It’s been a gorgeous week here in Dallas, Texas – lots of sunshine, mild temps…it’s perfect for enjoying an ice cold craft beer or a glass of red wine on the patio. Sneak out of work a few minutes early (we won’t tell!) and grab a drink with us! From 3-7pm enjoy $3.50 domestics, $4.50 house wines, or any drinks that are part of our Triple Threat (New Amsterdam vodka, Jim Beam Whiskey, or Camerena Tequila). If you’re looking for the best selection of delicious draft beer, then State & Allen is your place! And on Tuesdays, enjoy any of our great beers on tap for just ½ price. Go with the Revolver Blood & Honey or try something new and adventurous. You can have both when they are half off! We call it Wine Down Wednesdays and it’s the only way to spend your Hump Day. Grab a few friends and head over to the patio to relax over a glass of your favorite red wine. The weekend starts early at State & Allen – the best restaurant and bar in Dallas, Texas – with $3 Moscow Mules all.day.long! Light and refreshing, it’s the perfect accompaniment to happy hour or a dinner on the patio. Remember those happy hour specials we mentioned earlier? Well, Fridays at State & Allen mean Dallas happy hour all day! Come in for lunch, happy hour, dinner, or late night and you’ll get all these great specials anytime. Join us for a delicious Dallas brunch and $6 Bloody Mary Bar (the only Bloody Mary bar in Uptown Dallas), $3 Mimosas, and $3.50 Greyhounds, Screwdrivers, and Tequila Sunrises. Oh and after 3pm - $3 Wells. Ready to take in some beautiful Dallas patio weather? Join us on the best patio in Dallas - State & Allen Kitchen + Bar! Order your favorite glass of wine or draft beer and pair it with State & Allen’s delicious Charcuterie Board, prepared with artisanal cured meats, a variety of olives, State & Allen mustard, gherkins, sweet chili jam, and any other delicacies the chef might want to throw on that day. It’s the perfect accompaniment for Dallas happy hour or pre-dinner drinks. When it comes to sandwiches, lately we’ve been partial to the S&A Muffuletta – our take on the New Orleans classic. Each bite is chock full of cured meats including salami, capicola, and pepperoni, provolone cheese, and instead of the traditional olive spread, a sun-dried tomato tapenade. Yum. We’ve kind of obsessed with the filet mignon because A) it’s spectacular and B) it comes with two of our favorites: homemade three cheese mac and cheese and roasted vegetables. What’s not to love?! If you’re looking for the perfect entrée to celebrate the simple things in life, this is it. Save room for dessert because you chocoholics are in for a treat! Our rich, flourless chocolate cake is drizzled in berry sauce and berries and served with a side of vanilla ice cream. So on a beautiful Dallas evening, remember State & Allen is the place for dining al fresco! There’s no question we’re the best patio in Uptown Dallas! Fridays are for Drink Specials: Spend Black Friday with State & Allen! Skip the crowds this upcoming Black Friday and plan to spend the day with State & Allen Kitchen + Bar! Even if you are planning to get out early and bargain hunt, join us afterwards because we’ll be having our own version of Black Friday with delicious Friday drink specials! Fridays at State & Allen are for the $3 Triple Threat – one of the best drink specials in Dallas! What is the Triple Threat? The Triple Threat isn’t a drink exactly, but any combination of drinks you can think of that include New Amsterdam Vodka, Jim Beam Whiskey, or Camerena Tequila. Keep in mind, this is not a drink made with all three (gross! ), but refers to any mixed drink that uses vodka, whiskey, or tequila. So order a margarita, a whiskey & coke, or vodka tonic. All are just $3 – all day Friday! If one word describes this vodka, then “smooth” is it! Whether you want to drink this vodka on the rocks or mix it with something to create the perfect cocktail, New Amsterdam vodka goes down smooth every time. New Amsterdam credits its premium process of distilling the vodka 5 times and then filtering it 3 times to create the most delicious vodka around. The old favorite you can’t get enough of, Jim Beam is a staple around here. Did you know every drop of Jim Beam Bourbon Whiskey is aged twice as long as the law requires? It’s details like this that give it the richness of flavor that has been enjoyed for decades. The mark of great tequila is in the blue agave, and you can guarantee Camerena is 100% pure blue agave, sourced from the Camerena family farms outside Jalisco, Mexico. The result – smooth, delicious tequila - perfect when served on the rocks or mixed in a margarita. Just be sure to order a little Tex-Mex to go with it! Ready for Dallas Drink Specials this Black Friday?! Visit us at State & Allen Kitchen + Bar! Mark Your Calendar: Puppy Pool Party at State & Allen! You already know that State & Allen has the most dog friendly patio in Uptown Dallas. In fact, we were the FIRST patio in Dallas to allow pets! And with National Dog Day just around the corner, State & Allen wants to honor both you and your four-legged best friend with the perfect way to beat the summer heat – a Puppy Pool Party! The party will take place on August 26 (National Dog Day), and here’s just a preview into what we’ve got up our sleeves! I guess it goes without saying that you can’t have a pool party without a pool. We’ll keep your pup cool with pools conveniently located on the State & Allen patio for them to splash around in. It’s fun for your dog – and entertainment for you – all in one! Have you seen the Snackin’ Waggin’ around town? Homegrown Hounds Dog Deli and Bakery runs the Snackin’ Waggin’ and provides – you guessed it – a food truck for dog treats! Treat your dog to wholesome doggy treats that give them great nutrition and proceeds from the sales go to the dog rescue Hound Haven. Speaking of spiked drinks, State & Allen will be serving up a wide variety of Dallas drink specials featuring Smirnoff, Captain Morgan, and Crown Royal. You won’t want to miss our handcrafted cocktails at just a fraction of the price! Of course, we’ll also have a wide selection of craft beer and wine on hand as well. The event runs for 4-7pm on the State & Allen patio, and we can’t wait to see you there! State & Allen Kitchen + Bar recently revamped our beers on tap and we added a couple from a local Dallas-Fort Worth area brewery: Tupps Brewery. When creating craft beer at Tupps Brewery, the founders – Keith Lewis and Tupper Patnode – turn to their tastebuds first. A blend of creativity, smell, and taste goes into deciding whether it makes the cut, and if it does, it moves on to Step 2. Once the beer tastes good and everyone is pleased with the product, Tupps Brewery uses its state-of-the-art equipment to add quality control and consistency to each batch. At the end of the day, it’s about the taste. Tupps goes back and tries the beer again, ensuring each batch is delicious. So What’s on Tap at State & Allen? · TUPPS Day Off: We love this beer because it’s easy to drink any day of the week! Light, refreshing… sip it on the patio with friends at State & Allen and you won’t be disappointed! · Raspberry Shade: The perfect seasonal beer for summer, TUPPS Raspberry Shade blends the taste of sweet summer berries into the classic wheat beer, TUPPS Texas Shade. It will soon be your summer go-to beer! Join us at State & Allen this week to enjoy the best craft beer on tap and delicious drink specials in Dallas everyday of the week! What's on Tap at State & Allen? Do you ever wonder what’s on tap at State & Allen? Did you know there is a simple way to check our draft list without every setting foot in our Dallas restaurant and bar? TapHunter.com is the perfect resource to answer the question, “what’s on tap? !” State & Allen regularly updates the list, so you’ll always be current on what’s available today. It’s easy to visit the website or they have a handy app available for download as well. · Revolver Blood & Honey: An old favorite at State & Allen, our guests love it for its subtle hints of blood orange, Fall Creek Farms honey from right here in North Texas, and classic wheat flavor. · Goose Island Oktoberfest: Back for a limited-time, Oktoberfest is the perfect beer to ring in Fall. Beneath the beautiful copper coloring you’ll taste hints of dried apricots, toffee, and burnt sugar. · Einstok Olgerd Icelandic Toasted Porter: Looking to try something new? Give this porter a try! This super dark, almost black, beer may look intimidating, but it will win you over with its toasty, chocolate malts and smooth texture. · Peticolas Sit Down or I’ll Sit you Down: No beer list is complete without a signature IPA. Peticolas does it right with this rich Imperial IPA, made to showcase the delicious hop flavors. But beware – at 10% ABV – this beer will definitely sit you down if you don’t sit down first! Join us this week at State & Allen to enjoy these and other favorites on tap daily! Located at the corner of State St. and Allen St. in Dallas, Texas, we serve great beer, along with gourmet, scratch kitchen cookin’. If you are ever looking for a weekend roadtrip – just a short drive from Dallas, Texas – then consider an easy drive out to Cedar Creek Brewery in Seven Points, Texas. Cedar Creek Brewery was founded in 2010 by a man in search of the perfect craft beer. Jim Elliott had recently moved to the area just southeast of Dallas and had the hardest time finding good, quality Texas craft beer. His solution? Brew some himself! With a little hard work and ingenuity, Cedar Creek Brewery was born. Elliott brought on master brewer Damon Lewis, and between the two of them, the dream came to life. Using old dairy equipment, Cedar Creek began brewing amazing beer on a shoestring budget. What started as a very small operation in 2010 has blossomed in the last 5 years, gaining national recognition at the Great American Beer Festival, expanded into a larger operation, added a taproom for visitors, and so much more. If you drive out to Seven Points, you’ll enjoy the taproom complete with all the signature, small batch brews. And while you’re there, given the Plowboys Café a try, the in-house eatery that’s big on flavor and small town charm. Want to take some beer for the road? You’ll notice that all the beer is “bottled” in cans – not glass bottles. Cedar Creek does this to ensure quality first and foremost. Light and oxygen have a harder time entering the aluminum can than it does glass. Also, it’s more environmentally friendly and oh-so-much more portable for a trip to the lake. State & Allen loves supporting this brewery because it’s got the “American Dream” written all over it! Not to mention, the beer is pretty darn good. One of our favorites is the Dankosaurus IPA – with hop flavors of citrus and pine and a strong malt backbone - and it’s now available on tap at State & Allen! Try Cedar Creek Brewery and other Dallas craft beers on tap at State & Allen. You never know what new beer you’ll fall in love with! · Brunch is Where It’s At: State & Allen has the best Dallas brunch. Period. Amazing farm-to-table fare and delicious drink specials. Who wouldn’t love a mimosa served with fresh free range eggs and bacon?! And the cherry on top: State & Allen has the one and only Bloody Mary Bar in Uptown. Celery, pickles, onions, cherry tomatoes, the works. So many garnishes, you’ll have to see it to believe it. · Thirsty Thursdays are a Blast: Clear your schedule now and bring some friends to Thirsty Thursday. Drink specials abound, including specials on the widely popular Moscow Mule. · Dallas Scratch Kitchen: Executive Chef Rhett Dukes knows a thing or two about amazing cuisine. This isn’t his first rodeo, and he’s been nailing it lately with his daily chef specials. Sure, State & Allen has it’s usual menu items, but Chef Dukes keeps it interesting with fresh Dallas lunch and dinner specials. One of his most recent: Tuna Tartare "Nachos" served with pickled ginger and jicama slaw salad. · Texas Trinity Happy Hour: Vodka. Whiskey. Tequila. Drink it straight, or mix it with your favorite mixer. Either way, during our Texas Trinity Happy Hour, these favorites are just $3 a glass. Happy Hour is from 3-7pm on Monday-Thursday, then ALL DAY on Friday. · Half Priced Drafts on Tuesdays: Interested in sampling some new Texas beer? Come to State & Allen on Tuesday for half priced drafts in Dallas. See you this week at State & Allen for these and other amazing specials! Serving lunch and dinner daily. State & Allen is known for it’s amazing Dallas atmosphere, location, and food, but don’t forget about the uptown Dallas drink specials that put us on the map. Every Tuesday, we salute you and offer up delicious glasses of craft beer – all HALF OFF. Yep. You read that right! Run – don’t walk – over to State & Allen this week for lunch, dinner, happy hour, or any hour to get amazing beers at these amazing prices. · Peticolas Velvet Hammer: One of your all-time favorites and the beer that put Dallas’s own Peticolas Brewing Company on the map. This flavorful beer is dark, with almost a ruby red sheen to it. Malty and balanced, you’ll experience flavors of caramel, sweet brown sugar, floral undertones, and a sharp bitterness that makes one heck of a beer. · Revolver Bock: A traditional bock style beer, this classic beer is blended with a combination of Northern Brewer and Williamette hops. The result is a great beer with a slight sweetness to it. · Four Corners Local Buzz: Looking for something new and different? Give this sweet honey-rye golden ale a try. Sweet and fresh, it’s brewed with local honey and the rye gives it a spicy finish. · Real Ale Fireman’s #4: brewed and bottled in Blanco, Texas, Fireman’s #4 is Real Ale’s most popular beer, and it’s easy to see why. This beer is easy to drink with just about anything – or nothing at all. · St. Arnold Icon Beers: Every 3 months, St. Arnold brews a new specialty Icon beer and State & Allen’s got it on tap! Come in to State & Allen Kitchen + Bar this week to try these and other craft brews for HALF PRICE on Craft Beer Tuesdays! There’s never been a better excuse for Dallas happy hour. Goose Island or Jim Beam?! Love a good craft brew? Or are you more of a whiskey lover? Can’t decide? State & Allen’s got the perfect Dallas dinner date for you! State & Allen Kitchen + Bar will be hosting a Goose Island vs. Jim Beam Whiskey night on Friday, Oct. 23 at 6pm. Our Goose Island vs. Jim Bean Whiskey night will feature a prix fixe menu with 4 courses. Each of those four courses will be accompanied by both a Goose Island and a Jim Beam menu pairing. What a fun chance to try some new flavors and have some great conversation around what you like more! · Served with Shellfish Carpaccio: Shrimps, scallops, pea tendril, maitake mushrooms, almonds, pears, and French parsley, served with a homemade vinaigrette. · Served with Crispy Sweet Breads: Expertly prepared sweet breads with acorn squash hash, kale, sunflower sprouts, palm sugar, and a balsalmic reduction. · Served with Granola Crusted Fresh Figs: Figs are served over a bed of Hawaiian bread French toast, lingon berry jam, and molasses sherbert. The event will take place on Friday, October 23 at 5:30pm at the best restaurant in Uptown Dallas. Seating is extremely limited, so you’ll want to get your tickets today at State & Allen or at stateandallen.com. Just a few tickets remain! At just $50 each, this meal is a steal! Mark your calendar and buy tickets today for our State & Allen Kitchen + Bar beer vs. whiskey dinner! Mark Your Calendar: North Texas Beer Week is Coming! The 2nd Annual North Texas Beer Week will be happening in Dallas from November 6 – November 15, and it already promises to be bigger and better than the inaugural event last year! o Revolver Brewing Company is one of our favorite craft brew, so it’s perfectly fitting that we are hosting a Cinnamon Girl Vertical Tasting to kick off the week. And to top it all off, we're holding a Neil Young costume contest with prizes for everyone that participates! o This is a brunch you will not want to miss! State & Allen already had one of the best brunches in Dallas, but it’s taken up a notch with the Grapevine Craft Brewing Recovery Beer Brunch. Lots of delicious beers including 10 Gauge, Local 3113, Lakefire Dry Hopped, and Nightwatch, accompanied by amazing brunch pairings. Get your tickets today at stateandallen.com. o It’s our Bitter Sisters Pint Night! All night long you can sample some of the finest Dallas brews, straight from Addison. Featured beers include Busy Body, Cat Fight, Hissy Fit, and Family Trip. o If you come to anything, you’ll want to come to this! The Deep Ellum Tasting Event will be a full coursed meal that pairs the finest food with the finest Deep Ellum Brewing has to offer. Featured beers include Easy Peasy, Hop Seeker, Dallas Blonde, BA Four Swords, BA Numb Comfort, and Oak Cliff Coffee Ale. Get your tickets now to reserve your spot because it will sell out – available at stateandallen.com. o Ever have burning beer brewing questions you need answered?! Then this event is for you! It’s our Peticolas Pint Night + Q&A Session with the Brewers themselves. We will even have a special cask! Featured beers include A Lost Epic, Wintervention, and Great Scot Casked with Bourbon Soaked Oak Chips. o Experience some of our favorites out of Denton, Texas at our Audacity Brew House Pint Night! Featured beers include Evil Cream Soda, Bulletproof, and Gold Medal Winner - Black Widow. o Enjoy Kill the Keg Vol 5 with 3Nations Brewing featuring their GPA, Wit, and Brown Ale! o We love our brunch! The Texas Ale Project T.A.P Takeover Brunch will feature 100 Million Angels singing, Something Shady, and Naked Truth. We will also be featuring a special beer cocktail - the Naked Sunrise! So mark your calendars now for these great must attend events at State & Allen! Those times when you have to arrive at a restaurant 15 minutes early just to find a parking spot and avoid obscene valet costs, because you know you’ll be circling and stalking anyone who looks like they are even remotely walking toward a parked car. And in the end, you’ll end up deciding to park in front of some townhomes and hoping you don’t get caught. Here’s the good news: at State & Allen Kitchen + Bar in Uptown Dallas, Texas, parking is a cinch! In fact – parking is convenient and free! State & Allen Kitchen + Bar has 45 covered parking spots located just behind the restaurant. Just head down State Street or Allen Street, and as you approach State & Allen, look for the entrances on the right. You heard that right, each of our 45 parking spots are free of charge. Save your $10 parking fee and buy a drink or two instead. You can thank us later. Craft beer, wines, liquors, and perfectly blended mixed drinks are all available at State & Allen. Parking has a 3 hour limit, but don’t let that stop you! If you want to stay longer, just let the server know. We will validate your ticket for another 3 hours and make sure you are not towed. It’s as simple as that! Join us this week at State & Allen and rest assured that parking is not going to be a problem! Having free Dallas parking for our loyal patrons is a top priority at State & Allen and our sister restaurant, The Nodding Donkey. State & Allen is open 7 days a week and loves being your Dallas neighborhood restaurant and bar! We look forward to serving you this week.